Since 1993, the Santa Fe Conservation Trust has partnered with many landowners to protect their properties in perpetuity. The Santa Fe Conservation Trust currently owns two fee properties and holds 88 conservation easements on more than 39,675 acres in Santa Fe, San Miguel and Rio Arriba counties. We monitor these beautiful, protected lands annually, in perpetuity, ensuring they increase in value to society over time as growth comes to the Land of Enchantment. SFCT has been involved in the creation of the Dale Ball Trails, Atalaya Trail, Santa Fe Rail Trail, the Spur Trail, La Tierra Trails, La Piedra Trail and–with the Commonweal conservancy–the Galisteo Basin Preserve Trails. 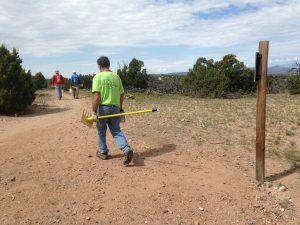 SFCT Trails Program works in partnership with the City of Santa Fe, SFCT’s volunteer group, The Trails Alliance of Santa Fe, and other entities to coordinate trail development and construction, organize volunteer trail work, identify and prioritize trail linkages, promote the trails, and provide the public with trail information and access through education programs and events. SFCT’s Passport to Trails Program has provided field trips to over 1500 fourth and fifth graders in Santa Fe Public Schools to introduce them to Santa Fe’s trail system. The Grand Unified Santa Fe Trail Organization (GUSTO) initiative aims to create an interconnected system of natural surface trails that allows non-motorized users to travel in a loop around the greater Santa Fe area, as well as between the city center and the periphery. In 1999, New Mexico enacted the Night Sky Protection Act; its purpose is to regulate outdoor night lighting fixtures to preserve and enhance the state’s dark sky while promoting safety, conserving energy and preserving the environment for astronomy. One of the first of its kind in the U.S., the Night Sky Protection Act makes dark skies a priority in New Mexico for the health of its people, wildlife, and economy. In 2008, SFCT created our Dark Skies program, to educate the community about the importance of the connection between land and sky conservation and the Six Easy Steps to Bring Back the Stars. Hundreds of people have participated in our educational Star Party events, done in collaboration with the Capital City Astronomy Club, Santa Fe Garden Club, Santa Fe Southern Railway, Salazar Elementary, and Commonweal Conservancy. We continue to celebrate land conservation in New Mexico and the importance of dark skies for future generations. Santa Fe has many options for in-town walks. And VÁMONOS offers a couple of walks a week that you can join in on. Get to know Santa Fe’s beautiful parks and trails, and meet others who like to walk by joining us on a free VÁMONOS walk. Group walking will help you stay motivated and meet others who like to walk. We have all levels of walkers, so you can walk at your own pace.